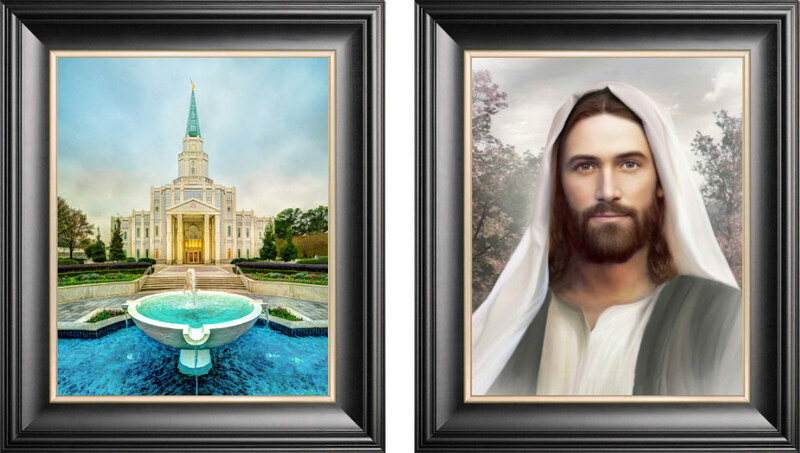 Featuring paintings of Jesus Christ, these beautiful combinations are perfect for any home. Start by choosing from the below combinations. Click on the “Select An Option” button for your choice, then you’ll be able to choose your applicable Christ painting or document. When applicable, you will also need to select a temple picture from our site and enter the Photo ID on the next page. 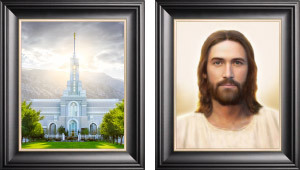 Choose one of four paintings of Christ and any temple on our site (temple picture subject to cropping). Available in solid wood frames (shown here), canvas wraps, canvas prints, and standard photo prints. Multiple sizes available. 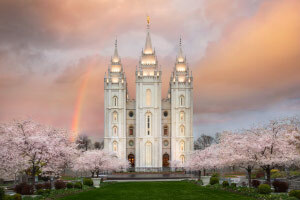 Choose any horizontally-oriented temple on our site and choose two from the Family Proclamation, The Living Christ, or the Articles of Faith with white or black backgrounds. Available only in barnwood frames. Outside frame sizes for the three pieces: 25×32, 44×32, 25×32 (94 in or 7.8 ft total width). Choose two from the Family Proclamation, The Living Christ, or the Articles of Faith with white or black backgrounds. Also choose any temple on our site (temple picture subject to cropping). Available only in barnwood frames. Outside frame sizes for the three pieces: 25×32, 25×32, 25×32 (75 in or 6.25 ft total width) or 32×44, 32×44, 32×44 (96 in or 8 ft total width). Choose one of four paintings of Christ and two from the Family Proclamation, The Living Christ, or the Articles of Faith with white or black backgrounds. Available only in barnwood frames. Outside frame sizes for the three pieces: 25×32, 25×32, 25×32 (75 in or 6.25 ft total width) or 32×44, 32×44, 32×44 (96 in or 8 ft total width). Looking for a different combination? Please get in touch and we’ll see what we can do for you!